Its wonderful to do virtual parties for co bloggers eventhough we never crossed personally in our real life. However the bond between some of the food bloggers are very much closer than the real life friends and family. One among the virtual family which is very close to my heart is Blogging marathon family. We, the members of this virtual family blogs together every month since years. One of this family member is waiting for her bundle of joy, obviously we want to celebrate this happy moment virtually so we cooked dishes from her blog and post it in our space today as a virtual baby shower.She is none other than Sapana Behl of Cooking With Sapana, we are very happy for you Sapana, take care of you and we are waiting eagerly for the day. Obviously the members of BM group jumped immediately to pick their dishes from her space. 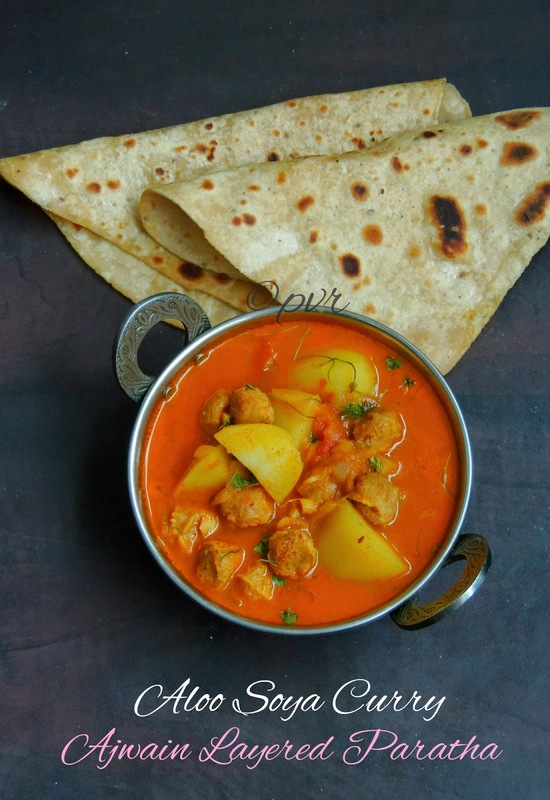 I have picked few dishes,initially i want to make something crispy for snacks but finally i cooked this alluring vegan aloo soya curry and a flavourful ajwain layered parathas for this virtual celebration. 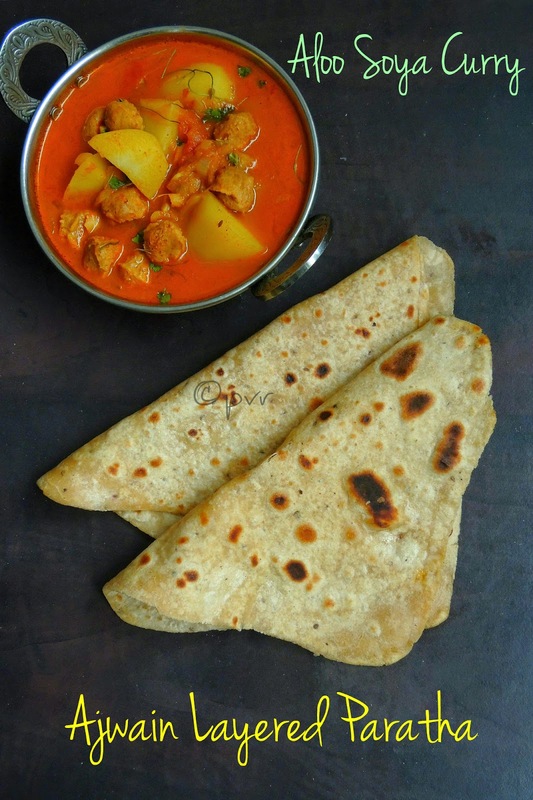 Trust me this vegan curry and ajwain flavoured parathas compliments very well together and am damn sure this combination suits absolutely awesome for a breakfast or simply for an evening dinner.Sending this post to Ahlan Ramadan-The Healthy Way. Boil enough water in a pan, add the tomatoes, let it sit, remove the skin and chop as small pieces. Heat oil in a pan, add the asafoetida powder, cumin seeds, fry it. Add the grated ginger, chopped garlic, chopped onions, cook until the onions turns trandculent, add the potatoes, all the spice powders, salt. Cook everything for few minutes, add the chopped tomatoes, slit opened green chillies,cook for few minutes. Finally add the soya chunks, cook for few minutes, add water as per need. Cook everything in medium flame until the potatoes gets cooked, gravy turns bit thick. Put off the stove, add the coriander leaves,top the curry with dry methi leaves. Take the wheat flour,salt in a bowl, add the water and turn everything as soft and smooth dough. Make medium sized balls from the dough,dust the dough ball with enough flour. Roll it as medium sized disc, apply the oil/ghee over it, sprinkle some carom seeds, some wheat flour over it. Bring half of this disc towards the center, press an another half towards the center. Just fold and overlap the layers as shown in the picture. Roll it as big round or as square. Heat a non stick pan, transfer the rolled paratha, drizzle oil,cook it on low flame on both sides until the parathas gets well cooked. Serve with butter,curries or chutneys. Both the dishes are so yum!..great way to celebrate! 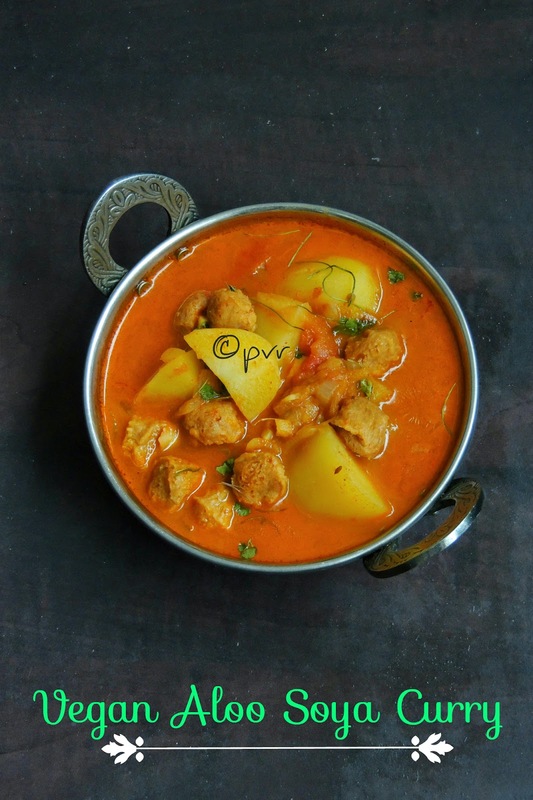 Aloo soya curry looka delicious and inviting.. nice healthy parathas too..
You tempted me to cook paratha now.. Delicious. What a fantastic recipe..you chose just the perfect healthy dish for Sapna..looks great!! I always add ajwain or jeera to my parathas. The flavour is good and can have it on its own with tea or coffee. Not a huge fan of soya chunks. tat curry n paratha looks divine..
delicious parathas with a tasty healthy subzi. This will make my day.. Awesome pairing Priya. Love both of them. Paratha and the curry, nice pairing and looks so delicious..
Nice combo. Both dishes have turned out great.